On 5 May 2014, World Health Organization (WHO) declared that the international spread of wild poliovirus (WPV) is a Public Health Emergency of International Concern. 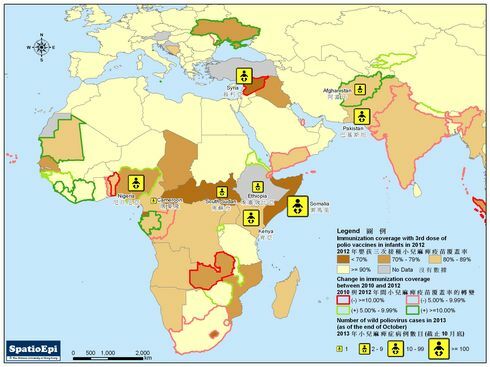 The map shows the distribution of WPV cases between 2009 and 2014 and the status of ten countries, which are currently in polio emergency. 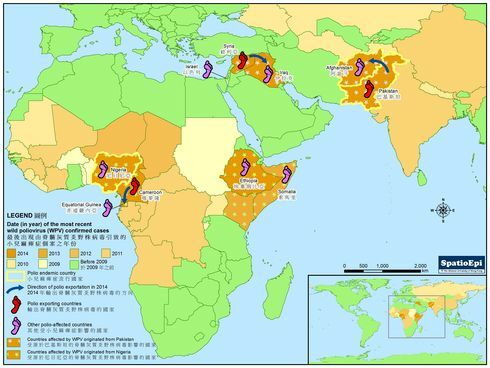 As shown in the map, there are ongoing polio cases in two regions - Central and Western Asia and a band of countries stretching from Nigeria to the Horn of Africa, in 2013 - 2014. Wild poliovirus circulating in Asia is mostly of Pakistani origin while polio endemic Nigeria remains the major reservoir of WPV in Africa. Recent cases in Afghanistan, Iraq and Equatorial Guinea were found to be linked to travellers from Pakistan, Syrian Arabic Republic and Cameroon respectively, which are now considered as polio exporting countries (indicated by red footprint symbols) in the latest WHO statement. 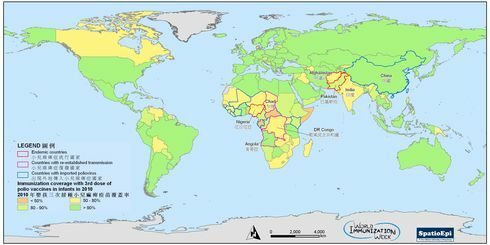 Footprint symbols in purple indicate that some neighbouring countries are also posing risk for future WPV exportations. As recommended by WHO, the states of 3 polio exporting countries should ensure that all residents and long term visitors to receive a dose of polio vaccine prior to their international travel. Data for the map were obtained from the Global Polio Eradication Initiative.